Rock out with pro sound through your computer! 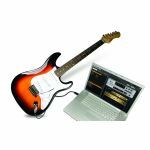 DISCOVER GUITAR USB is the easiest way to learn to play and record yourself on guitar. This complete package includes a stage-ready, six-string electric guitar with an all-wood body. Connect directly to your computer with the included ION GUITAR LINK cable and you're ready to go - No drivers required. The included professional quality Guitar Rig LE software makes you sound like you're playing through high quality amps and pedals that would normally cost thousands of dollars. Learn to play with the step-by-step guide and the video tutorials, and then record your performance with Guitar Rig LE software. Familiar tape-deck recording buttons make recording yourself easy. - Six-string electric guitar with all-wood body. 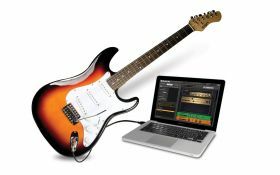 - GuitarLink cable directly connects guitar to USB enabled computer. - Record your guitar and add effects with Native Instruments Guitar Rig LE software. - Learn to play quickly with the included step-by-step playing guide. - Comes with video tutorials from Guitarmasterclass.net. - Complete with guitar strap and pick to start playing immediately. - GUITAR LINK instrument-to-USB cable. - Guitar Rig LE software. - Video tutorials on Learning Guitar.